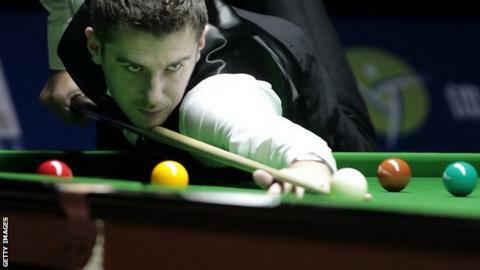 World champion Mark Selby cruised into the second round of the UK Championship with victory over amateur Oliver Brown. Selby became a father for the first time last week and had barely practised, but showed very little rustiness in his 6-0 win. He has been joined in the last 64 by crowd favourite Jimmy White and other former UK champions John Higgins, Matthew Stevens and Ding Junhui. But six-time champion Steve Davis lost to world number eight Ricky Walden. Davis, 57, battled from 2-0 down to level before Walden rattled off breaks of 100 and 98 on his way to a 6-2 victory. Davis's fellow legend White won four straight frames, including scoring a stylish ton in the sixth, to close out an impressive 6-2 win over Dave Harold. The 1992 champion now faces a mouth-watering meeting with China's two-time UK Champion Ding, who thrashed Irish amateur John Sutton 6-0. White was encouraged by his victory in front of an enthusiastic crowd who gave him a fantastic reception. "It's nice to play in a proper arena," the 52-year-old said. "I played pretty well in the second half of the match. "I will have to play very well to beat Ding but on my day I can still beat anybody and those games are why I still play the game. I can still play." Meanwhile Ronnie O'Sullivan has said he still hopes to play his first-round match after hurting his ankle while running. The four-time UK champion, who faces amateur Daniel Wells on Thursday, said on Twitter: "Might be one legged snooker at the #UKChampionship on Thursday." Earlier in the day Higgins and Stevens recorded 6-2 wins to progress with the minimum of fuss. Three-time UK Championship winner Higgins was relieved after his routine win over Lee Walker while Stevens beat Allan Taylor. Higgins, who won the tournament in 1998, 2000 and 2010, said: "Any win is a good win for me just now. I am low on confidence. Hopefully I can have a run here. "I have not really done much in the last two years, but I am still trying and the competitive desire is still there. I don't know if it will turn and restore confidence." The biggest shock of the day saw 18-year-old world number 99 James Cahill thrash world number 30 Mark King 6-0. And there were also wins for Ryan Day, Martin Gould and Tony Drago - who beat two-time ranking event winner Dominic Dale.